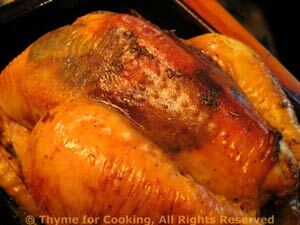 Roast Turkey for Thanksgiving, Thyme for Cooking gourmet menus. You could serve the soup in coffee mugs for your guests (or you) to sip while standing around chatting rather than a proper sit-down first course if you are feeling cramped for either space or time! I've added several recipes after the 'instructions': Spinach Gratin, Pumpkin Cake with Brown Sugar Frosting and Cranberry Cheesecake Pie. All can or should be made ahead. You can use fresh pumpkin for this, or the ' Libby's Pie Pumpkin', which is (or used to be) pure pumpkin... Check the label. Add pumpkin, stock, thyme and nutmeg. Heat to boiling, reduce heat and simmer 20 minutes. Add enough milk to get desired consistency. Gently reheat but do not boil. Sauté in 2 tsp butter, just until hot and starting to brown. Keep warm until needed. 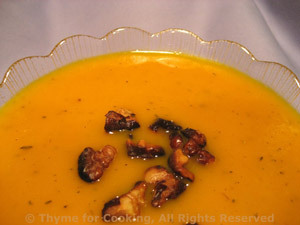 To serve: Ladle into soup plates or bowls, sprinkle with walnuts and serve. A stuffed 8 - 10 pound turkey will take 2 1/2 - 3 1/2 hours to took. You need a meat thermometer so you don't over cook it. It is overcooking that causes dryness. BTW, I checked some of my many cookbooks for roasting times and they ranged from 2 1/2 hours to 4 hours for an 8 lb bird... that's a big range - get a thermometer. Mix 2 tbs of the butter, the herbs and the mustard. Loosen skin across top of bird by pinching gently. Work your hand under the skin on the breast. With your finger tips rub butter mixture over the breast under the skin, covering as much of the surface as you can. Rub the remaining 1 tbs of butter over the outside of the skin. Spoon some stuffing inside the cavity loosely, about 3/4 full, and tie legs together. Put turkey on a rack in a roasting pan and into a 450F (230C) degree oven for 15 minutes. Reduce heat to 325F (165C) and roast until temperature in thickest part of thigh reaches 180F (82.2C) or 170F (76.6C) in breast, or until juices run clear when pierced with a knife. For a 6 lb bird this should take about 2 1/4 hours; an 8 lb bird 3 hours. Mix the soy sauce and vinegar. Baste the bird every 15 minutes or so alternating between stock, white wine, soy/vinegar and the pan drippings. Heat 2 cups of chicken stock with 2 cups of water. Add some celery tops (the ones you cut off the stalks for the stuffing, an onion, cut in half, a carrot cut into chunks and the neck. Bring to a boil, skim off any scum that rises. Simmer, uncovered, for 20 minutes, then add the gizzard and heart. Simmer another 20 minutes, skimming. Then add the liver. Simmer another 20 minutes. Strain the stock into a bowl and use in both stuffing and basting. Pull the meat off the neck and chop. Add the meats to the stuffing along with the onions, celery, Prosciutto. Lay the bread out the night before to let it dry. It, doesn't have to be perfectly, evenly dried. If you are using the giblets add 4 more slices of bread. Trim and chop the mushrooms, if using. Heat the butter in a large, nonstick skillet over medium heat. Add onions, celery, (mushrooms) and sauté until tender, about 10 minutes. Chop the Prosciutto and add to the onions. Sauté another 5 minutes. Tear bread into small chunks and put into a large bowl. Add sage and thyme and mix well. Add celery/onions and chopped giblets and mix well. I can't tell you how much stock to use. It depends on how dry your bread is, how moist the celery and onions are, etc. Start with 1/2 cup and drizzle over the top of the bread chunks. Mix well. Continue adding 1/4 cup at a time and mixing well. Mixture should just start to cling together, not all of it but most of it, and none of the bread cubes should be totally dry nor should they be mushy. Got it? At this stage stop adding stock. In small bowl lightly whisk egg. 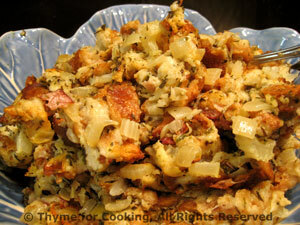 Fold into stuffing mixture and combine thoroughly. Refrigerate the remaining stuffing until ready to bake. Put the refrigerated stuffing into a roasting pan, cover and put into the oven. Bake the stuffing for 30 minutes, remove cover and bake 15 minutes longer. Oven temp is whatever works for the rest of the dinner. The stuffing in the bird will be very moist and in the pan rather dry - mix the 2 before serving. Remove the bird and put on a platter. Cover with a foil 'tent' and let rest for 20 - 30 minutes. Pour juices from the roasting pan into a saucepan, adding stock to roasting pan to help scrape up the bits on the bottom if necessary. Skim off as much fat as you can. Add any remaining stock and/or Madeira and bring to a boil over medium heat. Give cornstarch mix a stir and slowly whisk into the stock, stirring until thickened to your liking - more or less cornstarch as needed. Keep the gravy warm while you carve the bird. Remove stuffing from bird - both ends, and combine with baked stuffing. Carve, serve with stuffing and gravy on the side. Heat juice, sugar and half of the ginger until sugar is dissolved. Add the whole cranberries and cook, simmering, just until most of them 'pop'. Remove and, with a potato masher, mash 2 or 3 times, no more. Add the rest of the ginger, stir well and cool. This will get very thick when cool and will keep for several weeks in the fridge. Serve and enjoy Happy Thanksgiving! This is a bit decadent for such a healthy vegetable as spinach, but it will please even those who don't normally like spinach. 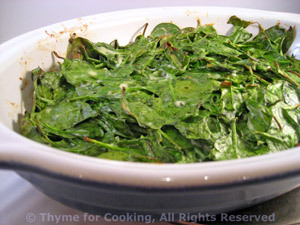 Wash spinach, if needed, remove thick stems, and roughly chop. In large bowl mix remaining ingredients. It's a messy job but fingers work the best. When you have a sticky paste add the spinach and mix well. 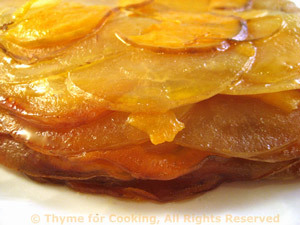 Put into a buttered gratin dish - a glass baking dish with low sides and bake at 375F (190 C) for about 30 minutes. Serve. Whip the cream, using whisk or electric mixer, until you have soft peaks. Stir together the soft cream cheese, sugar, milk and vanilla. It should be well blended, soft and creamy. Carefully fold in whipped cream (Stir very gently from the bottom up through the top and only until blended. You don't want to deflate the whipped cream.) Spread mixture into pie shell. 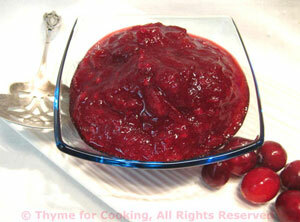 Mix cranberry sauce, marmalade and walnuts. Spread on top. Chill for at least 2 hours to set. Chop the walnuts if needed. Butter a 9 inch cake pan, then line the bottom with wax paper and butter the paper. In medium bowl measure flour, baking powder, salt, cinnamon, ginger, nutmeg and cloves. Gently stir to combine. In another bowl combine pumpkin, milk and baking soda. Now you are ready to start: Cream butter and sugar. (Using a hand or stand mixer beat the butter and sugar on medium speed until light, fluffy and a pale yellow.) Add eggs, one at a time, and beat on medium. Add half of the pumpkin and the flour, mix well at low speed then add the rest. Using a wooden spoon, stir in the nuts. Pour into prepared pan and bake for 55 minutes. It is done when a toothpick inserted into the center comes out clean and dry. Test it at 50 minutes - oven temperatures may vary. When done remove from oven and let cool for 5 minutes. Then, putting a wire rack on top of the cake, flip it over, remove pan and paper from bottom and allow to cool completely. When cool flip over so the top is up again and frost. I serve it with Praline Ice Cream on the side. Melt butter in medium sauce pan. Add brown sugar and, stirring constantly, bring to a boil. Boil for 1 minute stirring constantly. Remove from heat and let cool for 15 minutes. Add milk and stir vigorously. Add powdered sugar 1/2 cup at a time stirring well after each addition. Add just enough to make it thick but spreadable (and frosting like), not runny. I used 2 1/4 cups. Note: I didn't quite use all the frosting on the Pumpkin Cake (if you have graham crackers you can make sandwich "cookies" with any leftovers).